The Panzer Dragoon series of RPG's has always been one of Sega's few things they've done right... no matter how much of a dismal failure the system it plays on might be. Unfortunately, this one just didn't survive the transition to anime. That isn't to say the OAV is without good qualities. The character design is beautiful, and... uh... Okay, so that's all. Like ADV's earlier Tekken release, Panzer Dragoon is animated entirely on computer, but at the time it was produced (1995), the technology just wasn't there yet. Everything rendered looks like a bad CD-ROM game from a few years back, and at times, you can even see the pixels. The shimmer isn't as much of a problem this time, and the hand-animated segments are actually pretty well-animated, but everything that involves heavy computer graphics just looks incredibly dated. There is no subtitled version (for reasons obvious to anyone that watches it), and the dub, although well-cast, is REALLY horribly acted. Come to think of it, the script is so corny, I don't think there *IS* a way to make it sound good. The plot is your standard Super Mario Bros. hero-must-save-love-interest fare, but at least she isn't a princess. One nice twist is that she's blind. The only well-done scene is a flashback of the two of them together above a festival. I wish the whole thing was like that. Essentially, our hero Kyle is caught off-guard when he, his friend, and his "lady" Alita are assaulted by a black dragon on a hunting trip. 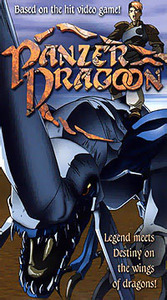 His friend is killed, and Alita is sucked onto the black dragon's back and is carried off. A blue dragon (whom Kyle treats like crap) tries to help him track her down. There's some other stuff there. An evil team or something... I don't know what that is. It's never adequately explained. This anime will attract RPG fans and no one else. Even they'll probably feel jypped.